Launceston R/C is proud to present the third annual Tiger Models Launceston Cup. Classes Saturday: Open/4×4 Short Course Truck, 2wd Buggy Stock, 2wd Buggy Open, Stadium Truck Open, Junior 10th Offroad. Full details including rules for each class below. Classes Sunday: 2wd Short Course Truck, 4wd Stock 10th Buggy, 4wd Mod 10th Buggy, 8th Big Bangers. Full details including rules for each class below. 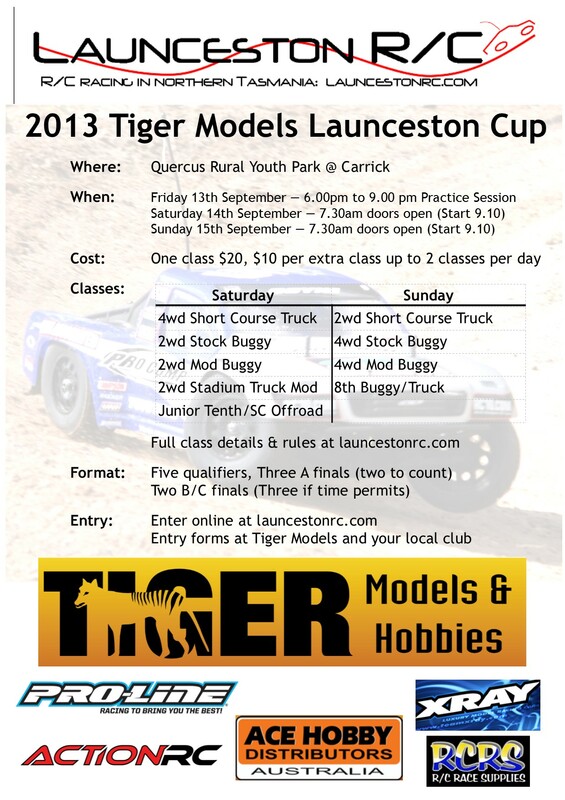 Entry Forms: Download the Launceston Cup 2013 entry form , or pick up in person at Launceston R/C, or at Tiger Models. Return completed form at Launceston R/C event, or by post to 48 Richings Drive, Youngtown, 7249. Or enter online here. Please fill in a second entry form if you are entering more than 2 classes over the weekend. Pay entry fees with the paper form, or on the day. Entries close 6th of September. YOU MUST PRE-ENTER THIS EVENT. Concours: Prize for best-presented car on Saturday and Sunday. The prize will be presented at the drivers briefing. Discussion Forums: The event can be discussed in the comments section here, or at the event thread at rctech.net. Transponders: This race meeting will be scored using personal transponders. It is your responsibility to supply your own personal transponder (AMB personal transponder and MyLaps RC4 are suitable). We have a very limited number of transponders available for rent on a first-come, first-served basis at $10 for the day (conditions apply). Rules: Rules for each class are outlined below. Race format and general event guidelines are as per Launceston R/C race rules. We anticipate this is a day that will be heavy on fun, and light on scrutineering and heavy-handed rule enforcement. Your cooperation will help make sure this is the case. Track: For those who haven’t visited Launceston R/C before, the track surface is smooth concrete, with timber ramps, artificial turf, carpet and other artificial obstacles. The track surface is low grip. There will be a fresh track layout for this event to limit the advantage of local drivers. Site Layout: Inside the Uniquely Pavillion will be the same as normal with race control, the canteen and drivers stand in the normal locations. Near the entrance will be a display by the Tassie RC Crift Group. Outside the main entrance wil be Bracknell Primary’s hot food stall, as well as the Tas Radio Rock Crawlong Group display on Sunday. The food and Rock Crawling will be where parking normally is on a race night. 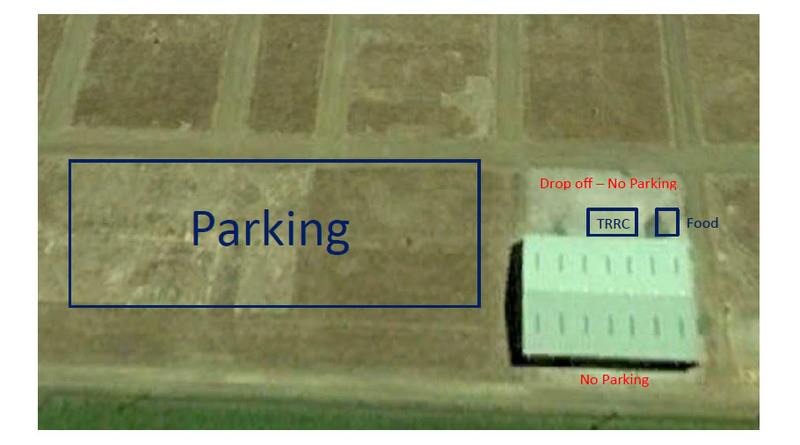 This will be a Drop Off Only Zone for the cup, with parking to the west of thepavillion as per the map below. There will be NO PARKING on the southern side of the pavillion. Food & Drink: Bracknell Primary will be operating a food stall on Saturday and Sunday providing Egg and Bacon Burgers for Breakfast. For lunch they will be selling gluten free sausages and Savaloys, as well as Hamburgers and Soup. Bracknell Primary will be running the stall as a findraiser for the Grade 5/6 Melbourne Trip, so please support them and buy food from them on the day. Tea and Coffee will also be available here. A practice session will open on Friday the 13th of September at 6:00pm. The track will close at 9:00pm precisely. Controlled practice 8:00 – 8:45 AM Saturday and Sunday 14th and 15th of September. Raffle: Our amazing raffle this year already has a stack of great RC items listed below. Tickets will be $2 each, or 3 for $5. Further prizes will be added to the list as they arrive. Another huge thankyou to our sponsors for their ongoing support. Please contact Richard if you can arrange for prizes to be donated for the raffle. On Site Displays: Launceston R/C is trying to encourage a range of RC organisations to have displays outside the Uniquely Tasmanian Pavilion for this year’s Cup. So Far the Tas Radio Rock Crawlers, Tas RC Drifters will be holding displays on Sunday of the event. Can my home club be changed to LRC please? Hi, can you cancel my entry for Stock 4wd. My entry was put in last fri meet 23rd but not on your list ? I’ve got your entry, will pass it on to Richard on Friday night along with Mark P’s. I was about to say, some electronic entries have gone by the wayside, but I have not seen any paper ones yet. Looks like Macka has yours! I will add it on friday night at the meeting. If anybody else has filled in the online form, and it has not shown up on the online lists, please redo your entry ASAP! Sorry to hear that. Will take you off the list.